Review of Evil Twin Yang Imperial Taiji IPA | Beer Apprentice - Craft Beer News, Reviews, Interviews and Info. It’s time for another craft beer review guys. Today, I’m going to be drinking the Yang Imperial Taiji IPA brewed by the Evil Twin Brewing Company based out of Valby, Denmark. I’ve been able to get my hands on quite a bit of Evil Twin stuff, however I’ve never had this one before. As we look on the website, eviltwin.dk, we find this bit of info about the brew. This is one half of a Black and Tan. Not just any Black and Tan, but the one where a toasted smug and a hoppy fella get together to make a sublime Taiji balance. Mix the Yang & Yin together (or enjoy this flipping good Imperial IPA solo). This beer came in a 12 oz. bottle and it had an ABV of 10.0%. It poured an almost amber to red color. It produced a well sized, off white crown from a medium aggressive pour. The texture was soapy, soft, frothy and just a touch rocky. The retention time was quite good and the lacing looked very nice. I could see some clear alcohol on the sides of the snifter when swirled and tilted too. All in all, a very nice looking beer. The nose was very resiny and dank smelling. Some tropical fruit tones intermingled with a cotton candy type of fragrance. Some sweet caramel malt and breadiness followed as it warmed while a small waft of alcohol couldn’t be denied. The alcohol seemed to become more prominent with each sniff. The taste provided a rather conspicuous hop bitterness. Deep tropical grapefruit, pine and sticky resin. A striking shot of caramel malt and dark breads were prevalent from the beginning. As a matter of fact, it was quite malty I thought. A sturdy relish of alcohol was discovered throughout also. It had a robust flavor profile, yet it was balanced nicely. The mouthfeel was medium to full bodied. Dry, oily, slick, chewy and sticky. The carbonation was of medium strength. An embossed amount of warmth and flavor was left behind long after each sip had passed. Overall, I found this to be an excellent “big” beer. It had tons of flavor and character. It wasn’t an extremely drinkable IIPA, but rather more of a sipper. One that I think I would like to have once the cooler months arrive. I’m more of a IPA fan than I am an “Imperial” IPA fan, however this is one of the best I’ve had in sometime. I’d recommend that you give it a try if you can obtain it. 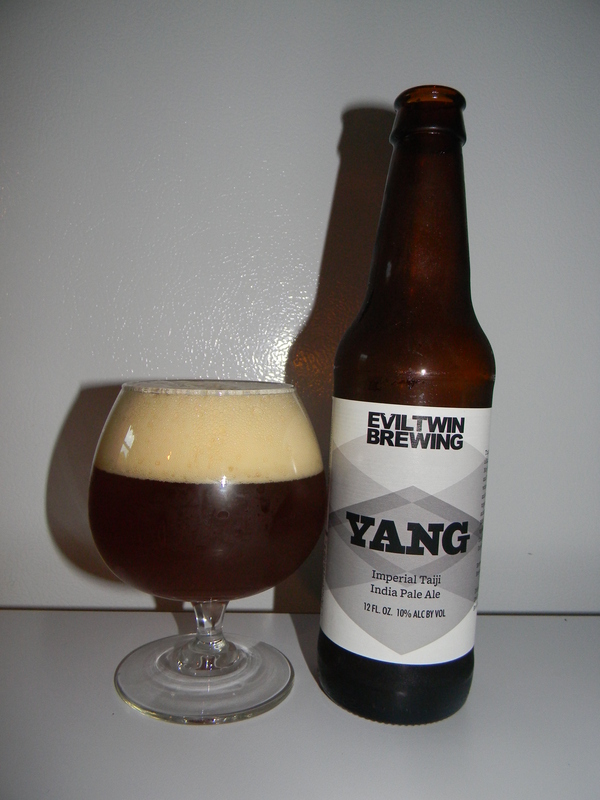 I do have a few bottles of Yin left, so I may have to mix a Yang with one and try the whole Black & Tan thing. So, if you guys sample the Evil Twin Yang Imperial Taiji IPA….. let me know what you think. I love to hear your opinion.